مارک شپرد (اینگیلیسجه: Mark Sheppard) بریتانیالی اوْیونچو. ۳۰ مئی ۱۹۶۴ ‏ ایلینده لندن شهرینده دۆنیایا گؤز آچیب. 1992 – گۆنوموز ایللر آراسیندا سینما ساحه‌سینده چالیشیب. 1992–1993 Silk Stalkings Eric, Eddie Bryce Episodes: "In Too Deep", "Schemes Like Old Times"
1993 X-Files, TheThe X-Files Bob / Cecil L'Ively Episode: "Fire"
1995 M.A.N.T.I.S. C. Flayton Ruell Episode: "Spider in the Tower"
1998 Sliders Jack Episode: "Net Worth"
1999 Martial Law Clay Sullivan Episode: "Thieves Among Thieves"
2000 Star Trek: Voyager Leucon Episode: "Child's Play"
2000 JAG Deputy Director of Air Operations/Young General Parker Episodes: "A Separate Peace: Parts 1 & 2"
2001 Invisible Man, TheThe Invisible Man Yuri Gregorov Episode: "Diseased"
2001 Chronicle, TheThe Chronicle Nitro Episode: "Bring Me the Head of Tucker Burns"
2001 Special Unit 2 The Chameleon Episode: "The Skin"
2001–2002 VIP Nero Episodes: "A.I. Highrise", "48½ Hours"
2002 UC: Undercover Mitchell Reeves Episode: "Manhunt"
2002 CSI: Crime Scene Investigation Rod Darling Episode: "The Hunger Artist"
2002 Charmed Arnon Episode: "Witches in Tights"
2002 Firefly Badger Episodes: "Serenity", "Shindig"
2003 Fastlane Ronan Dennehy Episode: "Simone Says"
2003 Jake 2.0 Hartman Episode: "Whiskey – Tango – Foxtrot"
2004 Las Vegas George Beckwahr Episode: "Degas Away with It"
2004 Monk Chris Downey Episode: "Mr. Monk vs. the Cobra"
2005 CSI: NY Kevin Hannigan Episode: "Hush"
2005–2006 Medium Dr. Charles Walker Episodes: "Penny for Your Thoughts", "Doctor's Orders", "Blood Relation"
2006 Without a Trace Ioannis 'Johnny' Patani Episode: "Requiem"
2007–2009 Battlestar Galactica Romo Lampkin Episodes: "The Son Also Rises", "Crossroads: Parts 1 & 2","Sine Qua Non","Blood on the Scales", "Daybreak: Part 2"
2007 Bionic Woman Anthony Anthros Episodes: "Pilot", "Sisterhood"
2008 Shark Rupert Stone Episode: "One Hit Wonder"
2008 In Plain Sight Russell Episode: "To Serge with Love"
2008 Middleman, TheThe Middleman Manservant Neville Episodes: "The Clotharian Contamination Protocol", "The Palindrome Reversal Palindrome"
2009 NCIS Marcin Jerek (young) Episode: "Broken Bird"
2009 Burn Notice Tom Prescott Episode: "Bad Breaks"
2009 Dollhouse Tanaka Episodes: "The Target", "Man on the Street", "Omega"
2009–2014 White Collar Curtis Hagen Episodes: "Pilot", "At What Price", "One Last Stakeout", "No Good Dead", "Live Feed"
2009 CSI: Crime Scene Investigation Dimitri Sadesky Episode: "The Lost Girls"
2009–2014 Warehouse 13 Benedict Valda Episodes: "Breakdown", "Beyond Our Control", "Around the Bend", "Buried", "Endless Terror", "Cangku Shisi"
2010 Chuck Ring فیلم یؤنتمنی Episodes: "Chuck Versus the American Hero", "Chuck Versus the Other Guy"
2011 Doctor Who Canton Everett Delaware III Episodes: "The Impossible Astronaut", "Day of the Moon"
2011 Prime Suspect Blackjack Mullins Episode: "A Gorgeous Mosaic"
2017 MacGyver Fake Dr. Zito / Jason Tennant Episode: "Cigar Cutter"
↑ Fowler, Matt (23 May 2014). 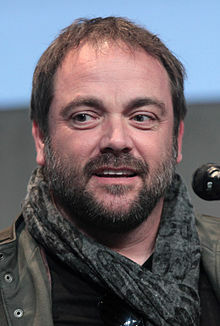 Supernatural: Mark Sheppard Promoted to Series Regular. IGN. یوْخلانیلیب17 August 2014. اینگیلیسجه ویکی‌پدیاسی‌نین ایشلدنلری طرفیندن یارانمیش«Mark Sheppard»، مقاله‌سیندن گؤتورولوبدور. ( ۲۲ ژانویه ۲۰۱۸ تاریخینده یوْخلانیلیبدیر). قارداش پروژه‌لرده مارک شپرد گؤره داها آرتیق بیلگی‌لر تاپابیلرسینیز.